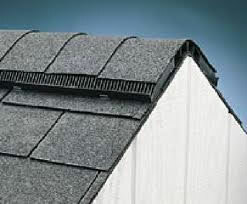 One of the most cost-efficient methods for cooling your home is having ridge vent installed on your roof. If you’ve ever sat in a physics class and really listened; you probably remember that heat rises. As heated air rises in your attic space, it floats up to the top ridge, mostly with nowhere to go. You may have those triangular gable vents and attic vents that can allow this extremely hot air to escape out the sides of your house. But if there’s not some strong breeze blowing nearby, your hot air is stuck upstairs… raising your AC costs and damaging your home! Stagnant attic heat can even cause roofing materials, rafters, and even insulation to suffer, becoming damaged and ultimately needing serious maintenance or roof replacement. And such may also occur to your residential roofing in Mooresville NC as well as residential roofing Charlotte NC. Adequate ridge vent does not just cool off your upstairs living spaces; it can add years to a home. Your shingles, like asphalt shingles, will last much longer. Ridge vent, unlike those big electric attic turbines, operates year-in, year-out for free; it’s all natural! Simply convection from rising warm air! Not to mention, ridge vent just looks good. It adds a finished look, a quality that’s very attractive and appealing on most homes. All newly built homes are required by code to include ridge vent along with soffit intakes to make a healthy and well ventilated, energy-saving roof system. It’s very important for homes to circulate air in their attic. The hot air rising is going to find its way out of your house ridge. And when wind is pushed over the ridge vent, it draws air out of the attic along the ridge vent as well. Replacement air is then typically drawn into the attic from the intakes along the soffit vent strips.. This process is part of a balanced ventilation system for your home. Caution: Many experts recommend that homeowner’s should never mix ridge vent with powered attic fans; this can create an adverse affect, in which, both vents will be pulling air from each other; instead of the intake vents along the eave and soffit. For your roofing needs and other home improvement services, you may contact Carolina Storm Roofing for help. Whether you are in need of roof replacement, roof maintenance, roof repair, and other roofing service such as ridge vent installation, you can count on us. Contact Us Today!